Is this an original chinstrap? "...Replacement parts for WW2 British type Brodie helmets. 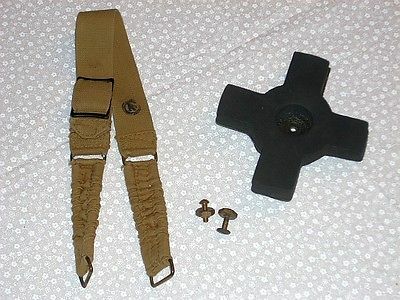 Includes REPRODUCTION rubber cross piece, canvas chinstrap and two brass bolts with nuts. The chinstrap was bought as original but I have my doubts. The brass hardware is original." Now I'm worried that I bought a repro chinstrap (or possibly an original with a fake stamp). Is anyone familiar with chinstraps of this style? I know Canada marked postwar chinstraps, but did they mark them in wartime as well? Re: Is this an original chinstrap? The chin strap looks OK to me as well, and a nice one at that. Nice find. And to answer your question most of the Canadian WWII helmets in my collection have the C broad arrow stamp. Thanks guys, that's a relief! I also don't see any red flags. Some of my chinstraps are also marked.